Teresa Onoda is an award-winning plein air artist who specializes in impressionistic oil paintings of Napa and Sonoma vineyards and Northern California landscapes. Teresa's aggressive brush strokes and bolder-than-life colors have caught the eye of many established art-collectors frequenting galleries in booming Northern California -- in San Francisco, near the ocean in Carmel by the Sea, Sausalito, and West Des Moines Iowa. After earning a Fine Arts degree at Creighton University, then teaching art in Omaha, Houston, Memphis, Bloomfield Hills and in the Bay Area. 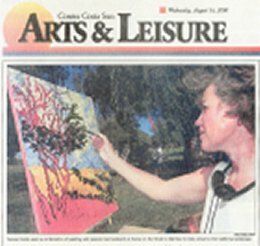 Teresa studied plein-air painting with well-known artist Pam Glover. In just a few years, Teresa's work began to gain attention for its powerful painting technique and use of pure color. Many began to appreciate the sense of movement and life she imbued in the landscapes captured on canvas. Most of Teresa's work captures the "endangered landscapes" of Northern California, the beautiful rural areas rapidly being developed to provide housing for the state's burgeoning population. As farms, forests and meadows of wild flowers are destroyed to make way for housing, Teresa is one of a small band of plein-aire painters trying to put on canvas the beauty that, ironically, attracts so many to live in one of the most attractive regions in the world. Teresa has her roots in a group that painted in the Bay area in the early 1900's called "The Society of Six." Several members of the Society of Six passed on their craft to young local painters, including Pam Glover, who painted with one of the group's founders, Louis Siegrist. She also painted with Siegrist's son, Lundy, who followed in his father's artistic footsteps. 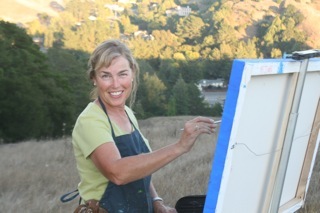 Mrs. Glover, in turn, has taught plein-air techniques to many accomplished artists, including Teresa Onoda, who teaches outdoor painting herself. Given the strong hold of the arts in California and the striking natural coastline and mountains this generation-spanning school of painting is certain to continue. 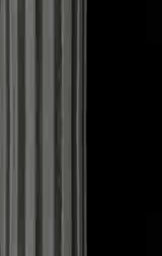 A GROUP OF US ARE STARTING SOMETHING WONDERFUL. 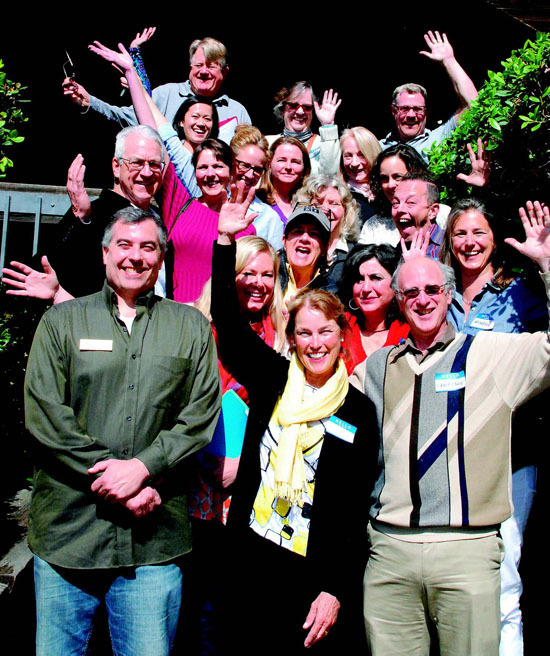 WE ARE GOING TO MAKE LAMORINDA (LAFAYETTE, MORAGA AND ORINDA) TO THE ARTS WHAT NAPA IS TO WINE. WE WILL HAVE THE MORAGA KICK OFF AT THE PEAR FESTIVAL, SEPTEMBER 26. YOU WILL SEE DANCE, MUSIC, POETRY, PAINTING, POTTERY AND WHAT EVER ELSE I CAN COME UP WITH THAT IS ART. I NEED TO SAY THIS WILL INCLUDE ALL AGES. JOIN US ON THIS AMAZING ADVENTURE. 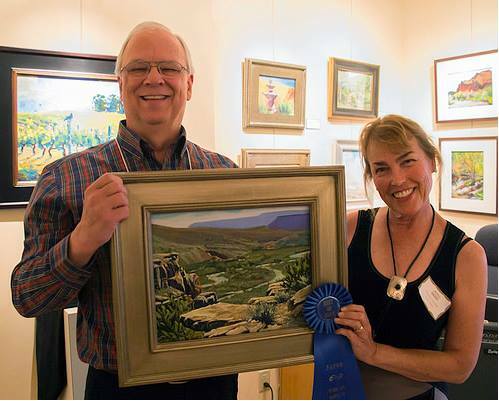 I was honored to be the judge of Plein Air Painters of New Mexico annual show. The work was spectacular. The first go around to see what work should get a ribbon I had 40 some pieces listed. Mike Mahon got best of show with this terrific piece in pastel. Plein-air painting has strong historical roots in California where the year-round temperature, climate, and generous amounts of sunshine encourage artists who seek to capture the beauty so abundant in the state. Teresa Onoda paints primarily among the rolling hills of the East Bay and the vineyards of the Wine Country. She occasionally paints in Nevada and New Mexico, as well. One other influence is the New Mexico Artists of the early 1900's. Victor Higgins, E. Martin Hennings, and Ernest Blumenschein are a just a few artists who use color more as symbols of land. Some were familiar with German Expressionism and pushed strong shapes, emotional colors to set a mood. They were not interested in the pretty painting, but instead a strong painting. 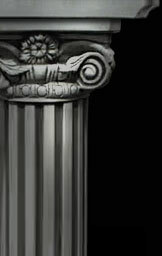 Copyright © 2004-2012 Onoda Art. All Rights Reserved.